Father George recently handed back his bedsocks as they had holes in the heels. I dutifully mended them, but thought this a good excuse to give him another pair. These socks are one size, but easily stretch to fit comfortably around a man's foot, as well as fitting round my own foot (small lady's), albeit loosely. If you want cosy house socks for a female foot then simply adjust the length. These are intentionally short at the ankle, but again you can easily knit them longer for the size you need. With No. 9 needles, cast on 60 stitches loosely, and arrange over 3 needles. 1st round: * K4, p2; repeat from * to end of round. 2nd-4th rounds: As first round. 5th (cable) round: * C4B, p2; repeat from * to end of round. 6th round: As first round. These are the six basic pattern rounds. Repeat these six rounds twice more, (or as many times as you need to lengthen the sock at the ankle), and then the first round once again. Next Row: Knit the first 28 sts of the round on to one needle to work for the heel. Divide the remaining 32 sts across 2 needles, and leave to work the instep later. If you have worked the pattern correctly there will be a symmetrical set of complete cables across the 32 instep sts, starting and ending with p2. Return to your heel sts, and turn the work so that you can work back and forth across the heel sts using 2 needles. Next Row: Slip1 purlwise then purl across the remaining 27 sts. [28 sts]. Next round: * Slip1, k1; repeat from * to end of round. Repeat the last 2 rows 12 times more. Continue working in this way until all the sts have been incorporated [16sts], ending with a knit row, and right side facing. Continuing to work onto the same needle (needle 1), pick up and knit 15 sts along side of heel. Slip all the instep sts on to one needle, and using a 2nd needle knit across instep sts, in the cable pattern, starting at the second row. Using 3rd needle, pick up and knit 15 sts along side of heel. Knit the first 8 sts from Needle 1, and slip these on to the end of Needle 3. [78 sts]. When you pick up sts down the side of the heel flap for this design of sock it is not essential that you pick up exactly the number stated - you do not even have to pick up the same number down each side of the flap - I often find that I have one more on one side than the other (this is due to the way I make the heel flaps which we won't dwell on here!). Whatever you pick up, you must decrease to the right number as you do the shape the instep - it's not the number of decreases but the final number of sts that is important. 1st round: 1st needle: knit to the last 3sts, k2tog, k1. 2nd needle: Knit, following the 6-row cable pattern as set. 3rd needle: K1, slip1, k1, psso, knit to end. Repeat these two rounds until 60sts remain (14 on the first needle, 32 on the second needle, 14 on the third needle). 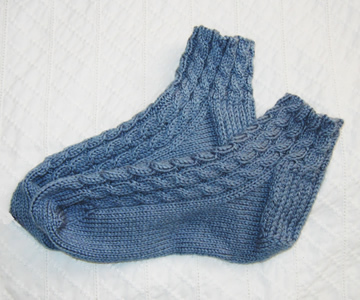 Continue on these sts, (continuing the cable pattern on the upper foot as set), until you have completed 12 cable patterns from the very beginning of the work, or until work measures 2 inches less than the desired foot length. Continue in stocking stitch only (no more cables), as follows: knit the sts from Needle 1, then knit the first st from Needle 2 and put it on Needle 1. Knit 30 sts from Needle 2, then place the last st onto Needle 3. Knit across 15 sts on Needle 3. Repeat these 2 rounds until 32 sts remain, ending with 1st round. Then repeat round 1 twice more [24 sts]. Knit the sts from needle one, break the thread leaving a long tail. Slip the sts from needles 1 and 3 onto one needle. Graft the two sets of 12 sts together. About 1 x 50g skein (139 metres) Phildar Oxygene, colour 38, Neptune. One set of 4 No. 9 (3½mm) double- pointed needles. 23 sts x 30 rows to 4 inches measured over stocking stitch on No 9 (3½mm) needles. C4B: "cable 4 back"; slip the next 2sts onto a cable needle and leave at the back of the work, k2, then k2 from cable needle. This cable is ideal to work using the method without a cable needle. psso: pass the slipped stitch over. Effectively you are "knitting 2 together through back loops"